Where many bills have been moving out of committee this week, UFA’s main focus has been on the BOF appointee. We appreciate the support of members who responded to our action alert for the legislative confirmation of Duncan Fields to the Board of Fisheries. The Governor removed Field’s name as BOF appointee and re-appointed Al Cain. Here is the Governor’s press release: https://gov.alaska.gov/newsroom/2018/03/alan-cain-re-appointed-to-alaska-board-of-fisheries/ . UFA will be writing a letter of endorsement for Al Cain slated to go out early next week. Mr. Cain has proven himself to be an unbiased member of the BOF, which is a win for all user groups in Alaska. The manner in which Field’s name was removed and Cain’s inserted has left many user groups scratching their heads. Early this week, UFA wrote a letter to the Governor, ADF&G Commissioner Cotten, and all legislators requesting a fair shot for appointee Fields and to please consider listening to both sides of the argument and not rely solely on the sport side to spin the vote with mistruths about equity on the BOF and Fields as a candidate. A confirmation hearing for Cain and Orville Huntington is scheduled in Senate Resources committee on Monday April 2 at 4:00 P.M., and in House Fisheries Thursday 4/5 at 10:00 A.M. – see below. Thank you for your continued support. For those of you headed out on the waters to catch the halibut, may your trips be prosperous and safe. CSSJR 13: Urging Co-management Plan for Sea Otters – was passed by the Senate and is now in House Resources… Current bill text… UFA letter of support. SB 210 – Mislabeling by retail food establishments was heard and passed in Senate State Affairs Tuesday , and is now Senate Judiciary committee… UFA letter of support. HB 231 Relating to the Alaska Commercial Fisheries Entry Commission was heard with public testimony today in House Finance, and is scheduled again for next Friday, March 6 (see below). HB 354 Dive Fishery Management was passed by House Resources on Wednesday and is in House Rules committee awaiting scheduling for the House floor vote…UFA letter of support. 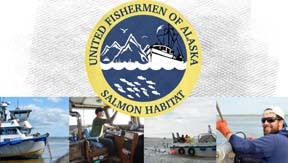 HB 379 Fishermen’s Fund Reimbursement was heard and passed from House Labor and Commerce on Wednesday, and is now in House Rules awaiting scheduling for a floor vote… UFA letter of Support. HJR 19: Arctic Marine Safety Agreements has passed House and Senate committees and is in Senate Rules awaiting scheduling for the floor vote. HB 173 – Climate Change Commission – was heard and held in House resources on Wednesday. HB 386 – Vessels” registration/Titles/Derelicts (House companion bill to SB 92) was heard and held in House Finance Wednesday. HB 199 – Salmon Habitat Permitting – A new version is coming soon and scheduled for House Fisheries committee on Tuesday – and again for public testimony on Saturday April 7 – see below. Meeting link… HB 129 is the third bill scheduled. Confirmation hearings – Board of Fisheries… and bills previously heard.